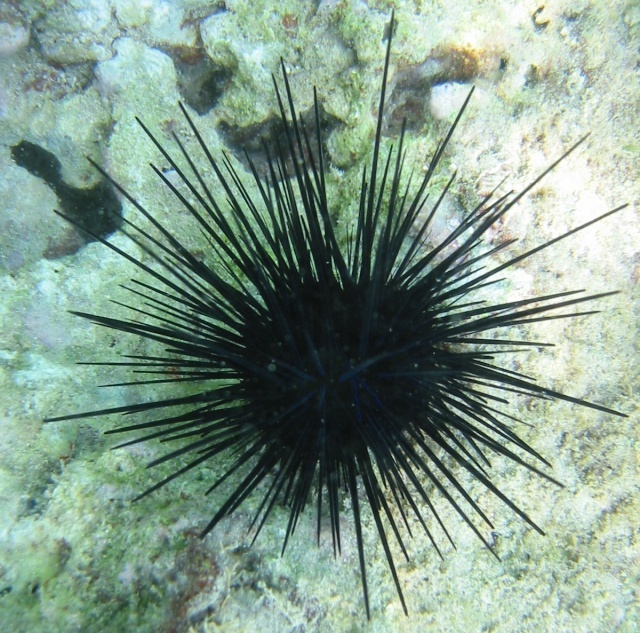 ^ We actually have lots of these urchins around Guam - very pretty in the center, where the spines get a deep blue hue to them. Siah told me about starfish bigger than a dinner plate!! I only know the ones from the rockpools and theyre hardly any bigger than my thumbnail. If you'r the one from Guam who dives then you MUST come to South Africa. I know someone who'll show you around, hee, hee. Lots of dive spots although they don't look as cool as Hawaii and stuff. I'm too to dive. We've got these white and brown striped Urchins in our rock-pools - one pierced my finger as a child. I do think the local Urchin populations are in decline lately, because I see less and less of them in the pools I frequent. But I did see another 'colony' of starfish this past weekend. They're as large as or even larger than dinner plates. Big yellow, hulking beauties.